Dr. Christopher Williams is an Associate Professor and the Electro-Mechanical Corporation Senior Faculty Fellow in the Department of Mechanical Engineering at Virginia Tech. He currently holds the W. S. Pete White Chair for Innovation in Engineering Education. 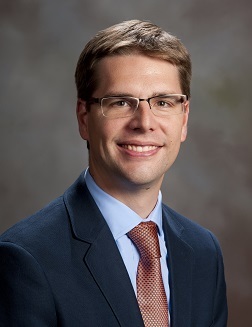 He is the Director of the Design, Research, and Education for Additive Manufacturing Systems (DREAMS) Laboratory (DREAMS Lab), and the Associate Director of Virginia Tech’s Macromolecules & Interfaces Institute. He holds affiliate faculty appointments in the Department of Engineering Education and the Department of Material Science & Engineering. His Additive Manufacturing (AM) expertise is focused in innovations in (i) AM processes and materials; (ii) design methodologies and tools to guide AM use (i.e., “Design for Additive Manufacturing”); and (iii) AM workforce development initiatives. Dr. Williams has authored over 100 peer-reviewed articles and has presented 30+ invited talks. He is a recipient of a National Science Foundation CAREER Award (2013). For his AM research contributions, he was awarded the 2012 International Outstanding Young Researcher in Freeform and Additive Manufacturing Award (FAME Jr. Award; presented by the International Solid Freeform Fabrication Symposium) and the 2010 Emerald Engineering Outstanding Doctoral Research Award in the area of Additive Manufacturing. His research contributions have been recognized by eight Best Paper awards at international design, manufacturing, and engineering education conferences. Dr. Williams has also received several recognitions for his contributions at Virginia Tech. He was named a College of Engineering Faculty Fellow in 2015. For his contributions in the classroom, he received the 2012 XCaliber Team Award, the 2012 Excellence in Access and Inclusion Award, the 2011 W. S. “Pete” White Award for Innovation in Engineering Education, and the 2009 Dean’s Award for Outreach Excellence. Dr. Williams holds a Ph.D. and M.S. in Mechanical Engineering from the Georgia Institute of Technology (Atlanta, Georgia) and a B.S. with High Honors in Mechanical Engineering from the University of Florida (Gainesville, Florida).